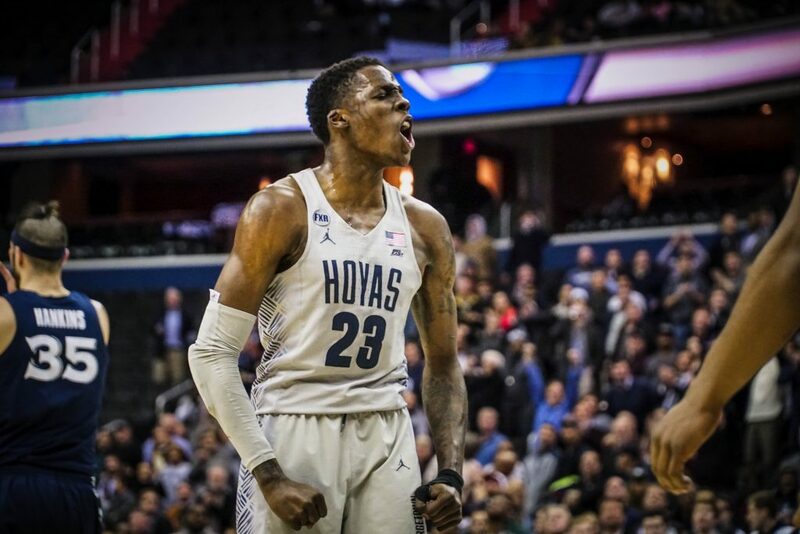 The Georgetown men’s basketball team (15-8, 5-5 Big East) defeated Providence (13-10, 3-7 Big East) on the road Wednesday night to complete the sweep of the Friars. 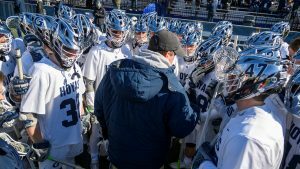 The win was a vital one, especially coming after a hard-fought loss to Villanova (19-4, 10-0 Big East) on Sunday. After finishing 5-13 in conference play last season, the Blue and Gray have already tied their win total from last year. The Hoyas’ 76-67 victory was a team effort with all five starters scoring in double digits. The Friars were led by sophomore guard Alpha Diallo, who posted 22 points and grabbed six boards. The Hoyas jumped out to an 11-4 lead, highlighted by a fast break 3-pointer from sophomore guard/forward Jamorko Pickett. After that, the game was close for most of the first half with the Hoyas and Friars going shot for shot. The Blue and Gray then heated up as a slam dunk from freshman guard Mac McClung and a 3-pointer from senior center Jessie Govan topped off an 11-0 run in the last two and a half minutes of the half. Coming out of halftime with a seven-point lead, Georgetown continued to show resilience and never looked back. Four minutes in, the Friars came within four points on a jumper from sophomore guard Makai Ashton-Langford, but that was as close as they would get. The defense did a better job neutralizing Diallo and the Providence offense in the second half, while the Blue and Gray offense took over. The Hoyas would eventually stretch their lead to double figures on another Pickett three. A late run brought the Friars back within seven with under a minute to go, but the margin was too large to overcome. Pickett played one of his best games this season, going 4-for-4 from behind the arc, racking up 12 points, double his season average. McClung also had a good overall game in the wake of his four-point performance at Villanova. The rookie put up 13 points, five rebounds, six assists and two steals. Perhaps the biggest factor in the win was freshman forward Josh LeBlanc. He collected 17 points—his second highest scoring total after his 22-point performance in the blowout win over Howard (10-13, 4-4 MEAC) earlier this season—to go along with 11 rebounds and two blocks. The Hoyas will next take on Butler (13-10, 4-6 Big East) at home this Saturday in a battle of the Bulldogs. With the exceptions of Villanova (19-4, 10-0 Big East) and Marquette (19-4, 8-2 Big East), the Big East standings are very closely packed together this season—the other eight teams all have between three and five wins. These next eight games will be crucial if they want a chance at making the tournament. To watch the Hoyas take on Butler, tune in to MASN2 or go to guhoyas.com for live stats. For coverage of all Georgetown sports, follow @GUVoiceSports on Twitter. Teddy Carey Teddy is a sophomore and the current Halftime Sports Editor. He is an avid fan of Gaelic hurling and the state of Arkansas. In his free time, Teddy advocates for the raising of NBA hoops because the league is currently too easy.